Is there a more sensible snack than the classic apple? This popular fruit is delicious, versatile, and accessible. And don’t forget about the myriad health benefits of apples. Did you know: 2,500 varieties of apples are grown in the United States and 7,500 varieties of apples are grown throughout the world. You already know the old saying: “An apple a day keeps the doctor away.” If you take it literally, it may be an exaggeration, but at the same time, it’s based on solid advice, because the health benefits of apples are numerous. With plenty of vitamins, minerals, fiber, and antioxidants, apples are a delicious and versatile way to regulate your digestive system and provide a healthy source of energy. They also have numerous positive effects on your cardiovascular system and help decrease the risk of serious diseases. So, when you need an easy snack to battle that afternoon slump, chop up an apple as a delicious salad topping, or dip a few slices in some peanut butter. 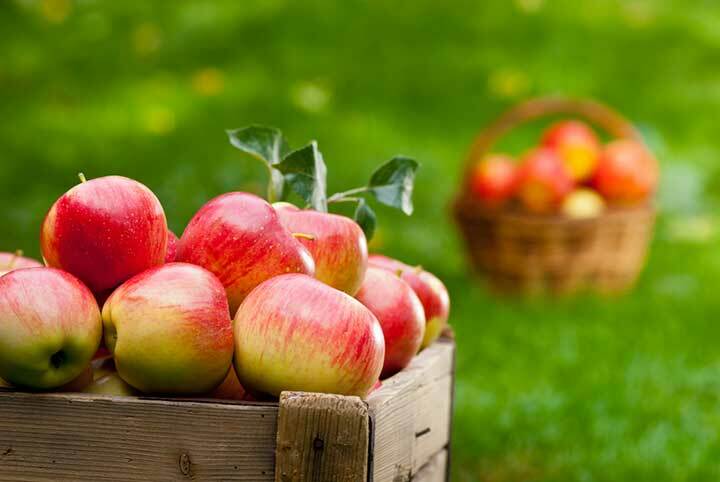 Then sit back and review some of the top health benefits of apples. Let’s start with the basics: According to the USDA, a medium raw apple with the skin on contains 95 calories, 0.3 grams of fat, 4 grams of fiber, 25 grams of carbohydrates, and 14 percent of the recommended daily requirement of vitamin C. But what medical experts have recently discovered in apples is a high level of antioxidants (in the form of flavonoids), which can help lower the risk of cancer and heart disease. When you bring your apples home, it’s best to store them at room temperature and serve them with the peel intact for extra fiber and antioxidants. The amount of fiber and vitamin C is reduced in applesauce, so choose a variety that has been fortified with vitamin C and avoid ones that contain added sugar. Dried apples are also a tasty choice, but keep in mind that while the fiber content is maintained, a small percentage of vitamins and minerals are lost during the dehydration process. Apples are particularly high in a flavonoid called quercetin, which, according to research conducted by UC Davis Medical Center, can provide significant health benefits. The Center’s 12-week study had 25 healthy men and women adding either 12 ounces of apple juice or two apples into their daily diet. The study measured each participant’s “LDL oxidation lag time,” or the amount of time it takes for LDL, or “bad” cholesterol, to oxidize when exposed to certain chemicals. The longer the lag time is, the lower the risk is for heart disease. The study showed that after six weeks, the participants’ lag time increased by 20 percent, with more dramatic results in those drinking apple juice vs. those eating apples. (Keep in mind, though, that eating whole, raw apples are healthier overall.) The study also showed a 22 percent increase in dietary fiber and a significant reduction in oxidation indicators. Quercetin has also been linked to a slower rate of digestion of carbohydrates, which improves blood glucose control. Research also shows the positive effects of foods rich in flavonoids on cancer prevention. A Finnish study linked a 20 percent lower risk of cancer overall and a 46 percent lower risk of lung cancer to a higher flavonoid consumption that included apples. Another Finnish study found that the participants who ate the most apples over a 28-year period had the lowest risk of stroke. If you’re looking to lose weight or increase your energy level, look no further than apples. Foods high in fiber are well-known for improving weight control, but there’s also proof that flavonoids-rich fruits and veggies can do the same. And because apples are low in calories and high in fiber, they keep you satiated for longer periods of time. And when paired with protein-rich foods, apples are a delicious way to boost your energy. The fiber they contain not only keeps you full, it also helps keep your energy levels steady throughout the day. And when eaten along with a snack like peanut butter—a top source of protein—an apple can keep you powered through the rest of your busy afternoon. Apple season is at its peak between early September and late October, depending on the variety. Whether you’re picking apples straight from orchard trees or from the produce section of your grocery store, you can ensure they’re fresh by gently pressing on the skin to check for firmness, looking for bruising or signs of decay, sniffing to detect a pleasant aroma, and looking for varieties with full and bright colors. If you’re wondering whether the benefits of apples can change depending on their variety, a recent study might have your answer. According to results published by the American Chemical Society, Red Delicious, Northern Spy, Ida Red, Cortland, Golden Delicious, McIntosh, Mutsu, and Empire apples have the highest levels of antioxidants. But don’t avoid other varieties of apples for this reason—you’ll get plenty of nutritional value from any variety you choose. Because most apples sold in markets are placed in storage to be sold throughout the winter, it was previously believed that they lose most of their nutritional value, but that’s not the case. In cold storage, apples can retain their antioxidant content for up to six months. When it comes to buying organic vs. conventionally grown apples, according to the USDA, you should go for the organic ones. Apples were #4 on the USDA’s “Dirty Dozen” list for the highest loads of pesticide residues. Keep in mind, however, that according to the USDA’s Economic Research Service, nearly a quarter of organically grown apples were sold as conventional in the U.S. because some farmers who grow organic produce choose not to be certified by the National Organic Board. Of course, organically grown produce can be more expensive, as any of us who frequent grocery stores can attest. But if going organic isn’t in your budget, don’t let that stop you from eating apples. Just make it a practice to thoroughly wash and dry all produce before eating, and to cut away any damaged or bruised areas to reduce your exposure to pesticides. Preheat oven to 375 degrees. Coat an 8-by 8-inch or similar 2-quart baking dish with cooking spray. Combine apples, cranberries, and granulated sugar in prepared baking dish; toss to mix. Cover with aluminum foil. Bake 35 minutes. Meanwhile, mix flour, oats, brown sugar and cinnamon in medium bowl with a fork. Combine apple juice concentrate and oil in small bowl; drizzle over flour mixture, stirring with a fork. Continue to work topping with your fingertips until dry ingredients are moistened. When crumble has baked 35 minutes, sprinkle flour mixture evenly over fruit. Sprinkle with walnuts. Bake, uncovered, until fruit is bubbly and tender, and topping is lightly browned, 25 to 30 minutes longer. Let cool at least 10 minutes before serving warm or at room temperature. Per serving: Calories: 216. Total fat: 5 grams. Saturated fat: 0 grams. Cholesterol: 0 milligrams. Sodium: 6 milligrams. Carbohydrates: 42 grams: Fiber: 4 grams. Protein: 3 grams. Preheat oven to 425°F. Place a rimmed baking sheet in oven as it heats. Place lentils, 3 cups water and 2 pinches salt in a saucepan. Bring to a boil, reduce heat to medium-low and simmer, covered, until lentils are tender but not too soft, about 25 minutes. Drain and set aside. 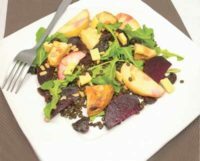 To assemble salad, divide arugula, cooked lentils, roasted vegetables and apples equally among 6 plates. Scatter gouda cheese over top, if using. Drizzle with sunflower seeds and dried cherries. To make Maple Dressing, whisk together 3 tablespoons oil, maple syrup, cider vinegar, shallot, mustard, thyme, salt and pepper in a microwave-safe bowl. Heat in the microwave 1 minute or until warm. (Alternatively, warm the dressing in a small saucepan on the stovetop.) Drizzle warm dressing over salads and serve. Each serving contains 423 calories, 20g total fat, 1g saturated fat, 0g trans fat, 0mg cholesterol, 241mg sodium, 55g carbohydrate, 15g fiber, 23g sugars, 10g protein, 18Est GL. Each tablespoon of dressing contains 54 calories, 4g total fat, 0g saturated fat, 0g trans fat, 0mg cholesterol, 59mg sodium, 4g carbohydrate, 0g fiber, 4g sugars, 0g protein, 2Est GL. 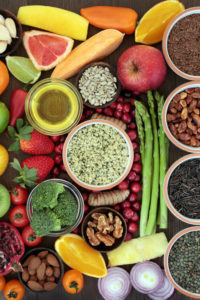 add, antioxidant, antioxidants, bad cholesterol, beets, calories, cancer, cancer prevention, cardiovascular, cardiovascular system, celiac, celiac disease, cholesterol, cooking, dehydration, diet, digestion, digestive, exercise, fiber, glucose, gluten, gluten free, gluten free more, gluten sensitivity, health, heart disease, increase your energy, ldl, Lose Weight, lung cancer, nutrition, nutritional value, organic, pesticides, protein, recipe, skin, stroke, sugar, thyme, trans fat, vegetables, vitamin, vitamin c, vitamins, vitamins and minerals, vitamins minerals, walnuts, weight control, whole wheat, whole wheat flour.